2017 Grand Sports loses 18.6 pounds of rotating weight an average of 4.65 pounds at each wheel by going to Girodisc rotors and hats. Looses another 33.2 pound by going to a set of Forgeline GA3R wheels. 51.8 pounds total of rotating unsprung weight. Last edited by Xplosive Performance; 12-18-2017 at 08:32 AM. Any issues with just replacing the Fronts on a iron rotor Z06? By backs are still in good shape and I'd like to wear them out before changing them out also. No issues with using the Girodisc iron up front factory in the rear as long as both are iron disc. I have a Z07 with the Essex AP Racing BBK in the front and stock ceramic brakes in the rear. I will need to replace the rear rotors this year. I am looking at various options. 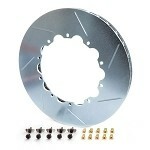 Can I purchase just the rear Girodiscs to replace the ceramic rotors? Last edited by Bill Dearborn; 01-19-2017 at 12:45 PM. Can you provide a link for the cast iron rings for the C7 Z06 with factory Steel rotors? Curious what rings alone will cost me.